Design of water supply and sewage systems. Design of water supply system. People began to conduct plumbing into houses and apartments at the end of XIX century. Water supply and sewage in the house are the benefits of the civilized world, which are aimed to improve the human living conditions. Choosing sanitary ware for bathrooms and toilets in an apartment, you do not think about their location, as the draw-off points are already installed, and communications are laid. But this is the result. And here’s how it all begins – the design of water supply and sewage should be carried out even at the stage of building a house. During this period, you can agree on all the details of the necessary communications and develop a future strategy for installation work. Designing internal engineering systems before the start of renovation will preserve its integrity and prevent you from unnecessary spendings. All drawings of walls including all plumbing elements, faucets and removal pipes for the sewer. These points will show us the place where the pipeline should go. If a client does not work with the designer, he has to provide this information to our engineer himself. Our specialist creates a project and negotiates all the details with a customer. An example of plan development of a water supply system for a 2-storey house. After receiving technical specifications from the designer, we can choose the diameter of the pipeline, depending on the flow of water and its speed of movement along the main pipeline. Its rate of speed should fit within the range of 0.4 — 0.6 m/s. If the diameter of the pipe is less than required, the speed will increase, and the residents will hear the noise of moving water. It will also increase the pressure in the pipeline and may lead to leakage. While selecting the diameter of pipes for water supply, it is necessary to take into account the simultaneous operation of sanitary devices. Traditionally, pipes with a diameter of 50 and 110 mm are used for the internal sewage system of the house. The first ones are used in horizontal sections that connect plumbing fixtures (sink or washbasin) and a standpipe. The standpipe itself and the toilet outlet must be at least 110 mm. An obligatory part for domestic sewage is the presence of a sewage riser, a prerequisite for the installation of such pipe – it must be installed vertically. It is designed for proper operation of the sewage system and prevents water plugs, which lead to unpleasant odors from the drain holes. This is due to the fact that all the air comes out through the roof thanks to the sewage riser. the presence of other buildings, roads, trees and other objects nearby, that may affect the installation of the water supply and sewage systems. An example of plan development of a sewage system for a 2-storey house. But the main factor that influences the choice of future systems is the number of people who will live in the house permanently. Taking into consideration these data, we can calculate the rate of water consumption. In standard terms, it stands for 70 liters per person a day. Therefore, the choice of water source is an important issue in the design of water supply system. If there is no possibility to connect to the central water supply system, residents need to make a well, given the required depth. Additionally, you should take into account the limits of the water source, as well as certain features of land forms and soil, which affect the throughput of the sewage system. The first problem is solved by installing an expansion tank which accumulates water. Its volume should be calculated from the indicators of the daily demand for water per person. Such containers create special pressure and equalize its drops. This allows you to protect a system from hydraulic impact and extend the operating period of the pump. The large volume of the tank (80 — 150 liters) provides a supply of water in case of emergency outage (power failure, breakdown, etc.). In this situation, about 1/3 of the specified volume of water will still be available for use, which will allow you to finish the manipulations with it (taking a shower or washing dishes). If the sewage system is not connected to the central one, and the drain goes to the installed septic tank, there can appear some problems that we have to foresee. The pipeline must be designed in such way, that it can cope with the movement of a given amount of fluid. But the main task is to calculate the required volume of the sewage treatment plant. The result depends on the number of residents and toilets in the house. It should contain the tripled daily rate of used water. For processing 500 liters, for instance, it is necessary to choose a septic tank with a volume of at least 1.5 m³. Incorrectly chosen anaerobic septic tank will lead to the situation when the «microflora» will not be able to cope with the task. It is also necessary to consider the absorption capacity of the soil to avoid water stagnation. When designing a sewage system pipeline, special attention is paid to the slope (2 cm per 1 meter) and minimization of the resistance points (turns), since the discharge is free-flowing. This will help to avoid stagnation and, as a consequence, the spread of unpleasant odors and the multiplication of bacteria. Also, it is important to remember about the quality of water supplied to the house. In order to use it for drinking directly from the tap, you should install a water treatment system. Moreover, water quality affects plumbing, human health, residents’ clothing and household appliances, scaling important elements. While selecting a water treatment system, it is necessary to take into account the composition of water and calculate its consumed volume, as far as it works along the flow path. Many filters and ionizers allow not only to exclude mechanical impurities and bacteria from the water, but also to enrich it with necessary microelements. If you develop a water supply project, you need to take into account the need for an engineering and utility services room where all the basic elements of water treatment will be located. The area should be between 2-4 m². This will simplify the access for specialists when their service is required. Often residents neglect this requirement and place equipment in the bathroom or even in the kitchen. Such decision can lead to the discomfort due to the noise from the system and the sounds of the pumps. For more convenience and space saving, the water treatment system can be combined with other equipment and installed in a boiler room, pantry or laundry room. Given the fact that the equipment for water supply and treatment systems consumes significant amount of energy, we need to design a proper power supply system. All automation pumping system must be connected to a separate line, which has its own fuse block. It should also have protection against dry running and an emergency shutdown device (RCD). A prerequisite measure is the location of electrical equipment beyond the reach of high humidity. After designing and installing a sewage system and water supply in a house where residents live on a constant basis, these systems only require periodic visual inspection. If we are talking about a country house or a cottage, which are usually empty during the cold period, then you should pay attention to safety measures and carry out the “conservation” of the systems. In this situation, you should pay attention to each «complex» zone. When creating a project of such cottage, it is necessary to consider the possibility of draining water from the pipeline. This concerns pipes that are placed both inside the house and that run outside. 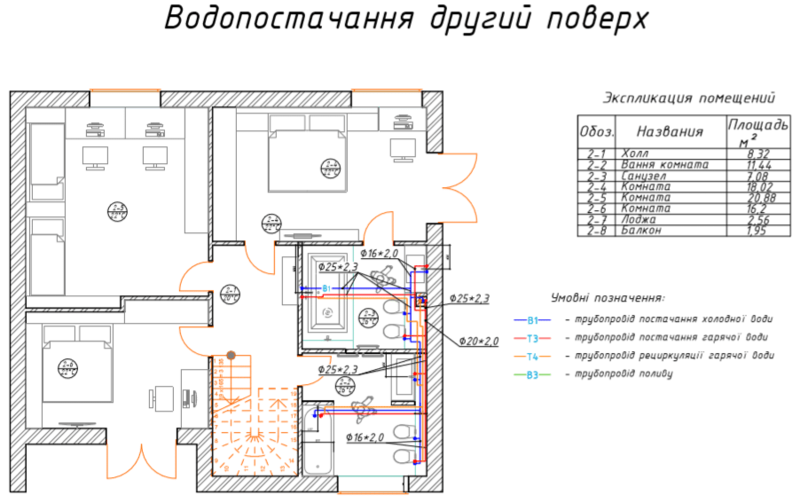 Support of «on-duty» heating in the house is more rational decision. This will not only prevent the pipeline from freezing, but also preserve the integrity of the building, increasing its lifespan. In order to avoid freezing and further leakage, we advise to place drain valves at the lowest points of the pipeline. At the upper level, it is recommended to install valves to connect compressor, which is responsible for pumping water out of the system. Such solution would be more optimal and less expensive than heating the entire house in winter, especially if no one lives in it. Experts do not recommend “hiding” pipes into the wall if they have threaded connections. In case of emergency, you will need to remove the tile and spoil the renovation. In such situation, it is better to use pipes made of cross-linked polyethylene. When living in a house on a regular basis, make sure that the room, where the technical equipment is located, is heated sufficiently. If you plan to leave the house for a short period of time, it is recommended to lower the pressure in the entire system and turn off all the pumps. The result and further work of internal engineering systems depend on the professionalism of engineers and well-designed project. This will ensure the correct and durable operation of the water supply and sewage systems, as well as protect you from facing any unnecessary financial expenses. 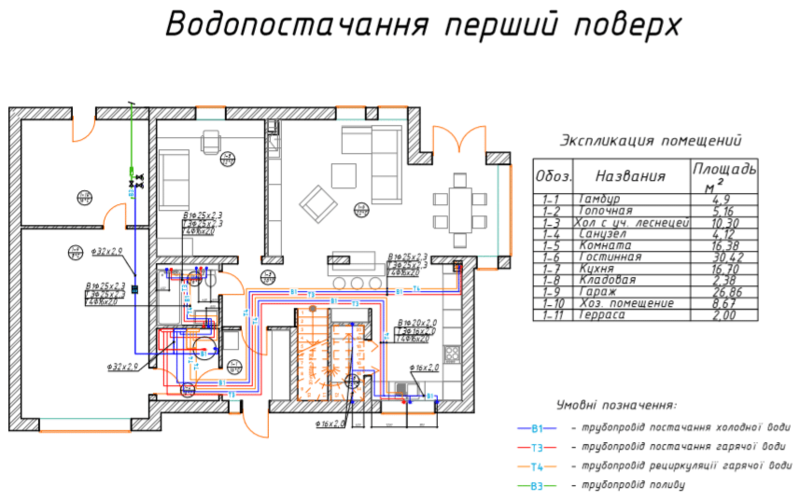 Implementation of heating, water supply and sewage systems in the private house (Zeleniy Bor). Embodiment of heating, water supply, sewage and plumbing systems in a two-level apartment in Gatne village. 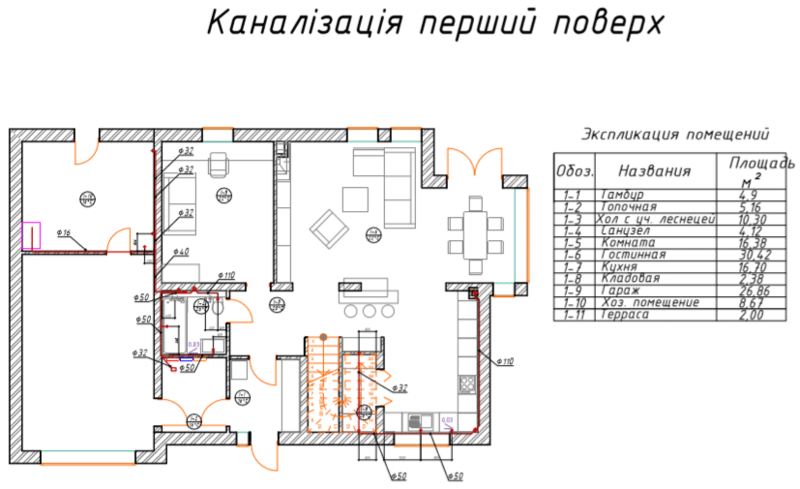 Improvement of engineering systems in a private house. Cottage town Zoloche. 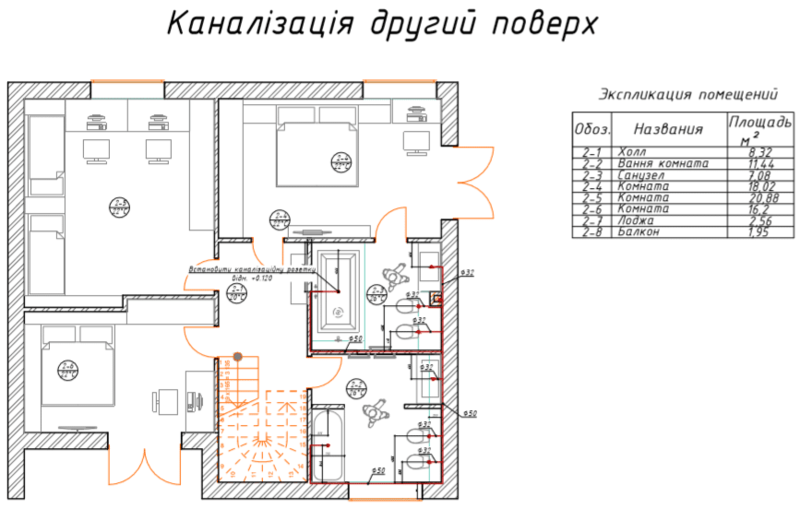 A project of implementation of engineering systems in a private house (cottage town Green Hills).